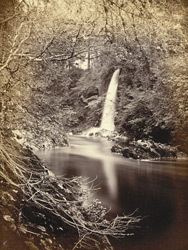 "In its short course of five miles, the Fender makes three picturesque falls - the first, or upper fall, about a mile from its mouth; the second, a short distance from its confluence; and the third, at its union with the Tilt, where it discharges its waters over a rocky chasm into the stream below. Near the point shown in this view is built an alcove in which is a stone, and upon it, if the foot is placed, a sound is distinctly conveyed to the ear like the rushing of many waters. This was shown to the poet Burns, when one time on a visit to the Duke of Athole, who was particularly impressed therewith."